Fall has officially arrived here in Ohio – the leaves are turning beautiful shades of rust, brown and gold, but the temperature seems to want to hold steady in the low 80’s. I’ve been totally disregarding the uncharacteristically warm weather by cooking and baking some of my fall favorites. Though I will say it’s a bit odd to have the aroma of pumpkin bread being wafted through my house with aid of the central air. This week’s Holiday Recipe Exchange is centered around one-pot meals. Think hearty stews, soups, casseroles and of course – chili. And what better vessel to prepare these one pot meals than a gorgeous Le Creuset French Oven? I have had a sticky note flagging this recipe for Prime Rib Chili for about a year now. There was just something about a homemade chili powder and the use of Prime Rib that caught my eye. And seriously, what sounds like more of a man pleasing, football watching meal than a hearty chili made with Prime Rib? 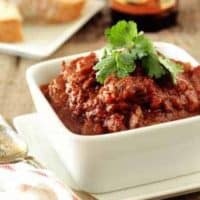 This chili takes a little bit of time to prepare and is also not the cheapest one in my chili repertoire, but in my opinion, it is worth the splurge – especially if you catch a good sale on Prime Rib. This chili is also sans the beans – which I totally caught Brian digging for in his bowl, but we both agreed they certainly weren’t missed. If beans are a must-have in your chili, I’m betting you can cut back on the Prime Rib and toss in a can of kidney beans. The one thing I wouldn’t skimp in this recipe is the homemade chili powder – it was incredible and super easy. I just gave everything a quick whirl in my Magic Bullet and I was ready to go in a few minutes. Let it be known – this chili certainly has some kick. We found the level of spice and heat to be just perfect, but if you’re not fond of the heat, I’d definitely cut back on the chipotle peppers in adobo. We want to know what your favorite One Pot Meal is – so follow the directions below for linking your best One Pot Meal. 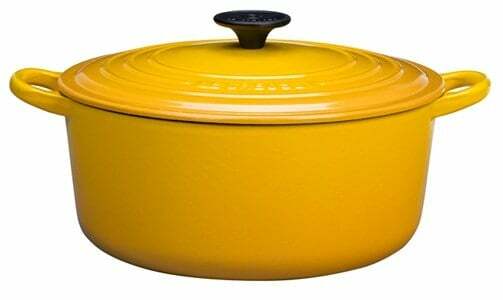 You’ll have a chance to win one of two gorgeous 3 1/2 Quart Round Le Creuset French Ovens – in the color of your choice. Remember, you don’t need a blog to participate! Seed and hand-tear 2 ancho chiles (these are dried pablano peppers). Toast chile pieces and 2 tablespoons whole coriander seeds in a dry skillet over low heat until fragrant, shaking the skillet so they don't scorch. Put the chiles and coriander seeds in a blender and pulse until you have a fine powder. Add 2 tablespoons purchased chili powder, 2 tablespoons sweet paprika, 1 tablespoon ground cumin, 1 tablespoon dried oregano, 1 tablespoon sugar, and 1/4 teaspoon ground cinnamon. Process until well combined and you have a fine powder. Stir in 2 tablespoons kosher salt. Store in an airtight container for up to 4 months. 1. Season the beef with salt and black pepper. Set a large, French Oven over medium-high heat and add in extra-virgin olive oil. When the pot is very hot, add the beef and stir until brown. 2. Add in the onion, garlic, and chipotle peppers. Stir in chili powder. Stir in tomato paste and the entire can of tomatoes with their liquid into the pot. Stir in chocolate. 3. Add enough water to just cover the meat and simmer over medium-low to low heat, uncovered, until the meat is forktender, about 2 hours. 4. When the meat is forktender, use a slotted spoon to remove the beef to a cutting board. Using two forks, shred the beef into pieces and return it to the pot. At this point, taste the chili and season with salt and black pepper. Continue simmering for another 30 minutes, stirring occasionally. Garnish with fresh cilantro. - Chile peppers are HOT, so wear gloves when preparing them for this chili. Be sure to keep your hands away from your face. Wash hands thoroughly after prepping the peppers. 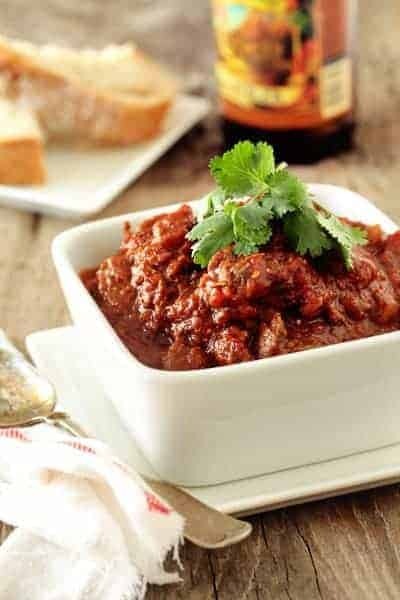 - This chili is spicy – if you are fond of heat, you’ll want to cut back on the chipotle peppers in adobo. - If you think the chili to too thick, gradually add in a little water until you reach the desired consistency. - I have not tried this recipe with another chili powder; therefore I cannot comment as to how it will turn out. - I found my dried ancho chiles near the fresh peppers at my local grocery store. Write and post a recipe on your blog featuring ONE POT MEALS. Include “Come join the fun at the My Baking Addiction and GoodLife Eats Holiday Recipe Exchange sponsored by Le Creuset.” in your blog post. Submit your post before Oct. 17, 11:59 PM.